See the bright lights of New Orleans at night on a 45- or 60-minute sightseeing flight! While listening to commentary from the pilot, relax in a small sightseeing plane that seats a maximum of four passengers. Gaze down at illuminated city attractions such as the Port of New Orleans, Mercedes-Benz Superdome, Mississippi River and more, and admire nighttime views of the French Quarter. If there is a sight that you particularly want to see, simply let the pilot know! The itinerary is flexible and can be tailored to the sights that the group want to see. 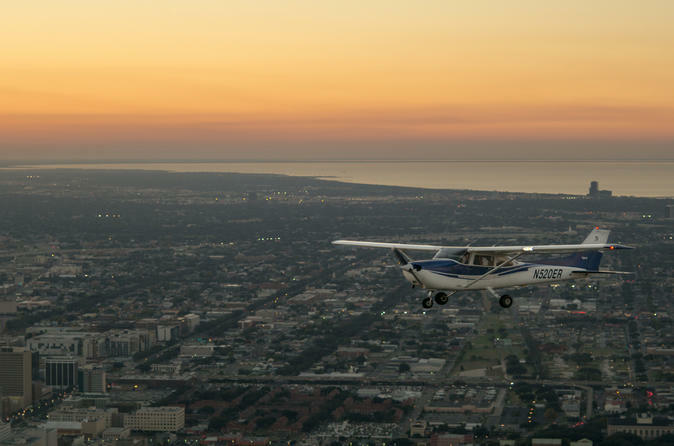 Board your four seat airplane at New Orleans Aerial Tours and Flight Training, take a seat, and then soar into the air above the city. Watch the flashing lights of the runway fade as the white lights of the city dominate the nightscape stretched before you. As you soar through the skies above the Mississippi River, listen to your pilot’s tales about the city and its countless sights. Hear about different New Orleans neighborhoods as you pass above the French Quarter, and admire the streetlights casting a glow on its architecture. Peer past the lit-up skyscrapers of the Central Business District and soar around Mercedes-Benz Superdome, where New Orleans Saints American football team play. Loop around the domed stadium and have your camera ready to capture sights of the Port of New Orleans with its 2-mile (3-km) wharf. Glide a short distance from downtown New Orleans to admire aerial views of Southern Louisiana’s bayous—the slow-moving streams of water around the Mississippi River. After admiring the nighttime views of the county’s famous wetlands, loop back into the city and touch down at the start point where your experience finishes. If you have more time free, upgrade to a 60-minute flight and spend longer in the air, checking out all the city’s attractions. Itineraries for both durations are flexible and can be tailored to the New Orleans’ sights that you want to see.